So what’s the deal with Beautycounter?! Maybe you’ve seen me or another friend posting about it on social media, or you caught this story on the Today Show. November marked my third year working with the company so I could go on and on I’ll try to keep it short and focused on a few things I really want you to know. First, I’m not about making women (or men!) feel like they need to change the way they look. I’m focused on educating and empowering my clients to choose safer versions of the products they’re already using. Second, Beautycounter is not in any way trying to fear monger. Rather, we’re pushing for more regulation to ensure the safety of all personal care products and shine a light on an industry that needs reform. Finally, Beautycounter is actually not “all natural” or “organic” but incorporates synthetic ingredients when it makes sense, so long as they are proven safe. That’s one of the reasons why our products perform so well! I’ll never tell you you need any product and if you aren’t that into skincare, that’s ok! If you’re not a makeup person, go barefaced! However, Beautycounter is a reputable, effective, transparent, and safe company to go with if you are going to be buying these products. And if you have a specific skincare concern or love makeup, I can recommend some of our products that may work well for you. I love to share samples. I’ll never tell you that your current products are going to kill you. What I will say is that certain common personal care ingredients have been linked to hormone disruption, reproductive toxicity, cancer, and more. Linked is not the same as causation, but we need more research and I’d rather be safe than sorry. I used the Never List when I was cleaning out our bathrooms and making safe swaps and I also recommend the EWG Skin Deep Database for checking out ingredient labels. Finally, it feels great to partner with a company that puts health and safety first. Beautycounter goes above and beyond what is required and is a Certified B Corporation, which means they are a for-profit company that meets rigorous standards of social and environmental performance, accountability, and transparency. 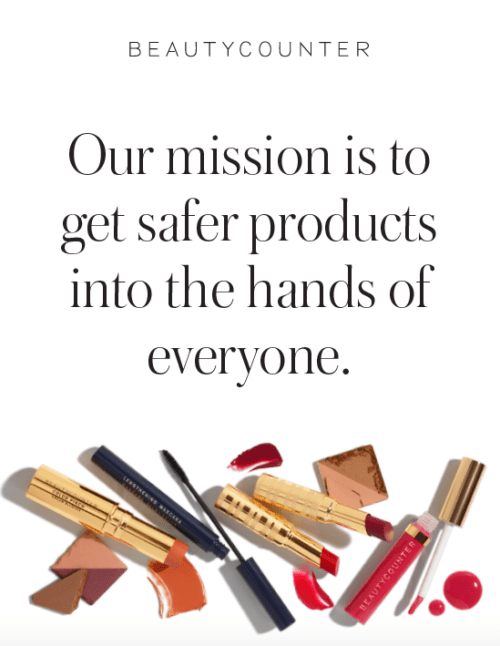 Beautycounter’s mission is to get safer products into the hands of everyone and education and advocacy are essential to this mission. If this resonates with you, there are many ways you can get involved as a consultant like me or as a client. You can browse and shop all Beautycounter products online or in person at our NYC store. If you want to learn more, please reach out and I can add you to my newsletter. Thank you!! I’m so glad you’ve found some favorites. trying new products you feel are safe for your skin is the best way to discover what you like and need. Agree and I love sharing samples for this reason! Thank you for your support!